The Vermont State Police station in Spurbury is about to be shut down due to budget cuts. Its captain, John O'Hagan, is determined to prevent that from happening and encourages his troopers to step up their enforcement efforts to show the Governor they are a model station. There's just one problem. O'Hagan doesn't have model troopers. Foster takes his job half-seriously at the best of times. Womack is obsessed with pulling pranks. Rabbit is a green rookie. 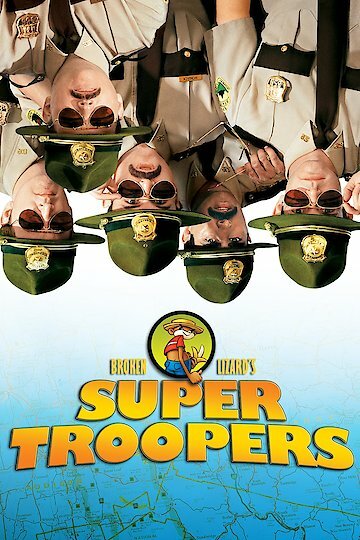 Farva can't go more than a few days without being suspended, while the station's second-in-command, Ramathorn, is more of a buddy to the troopers than a boss. These misfit troopers have a chance prove their mettle. When they come across an RV abandoned in a wooded area, they discover a dead body and a live, crazed pig. They soon learn that the RV contains a large stash of marijuana. Such a bust would surely convince the Governor to keep their station open. But there is a problem. The local police department is trying to take credit for the bust. Can O'Hagan's troopers overcome their bumbling ways and keep their jobs? Super Troopers is currently available to watch and stream, buy on demand at Amazon, Vudu, Google Play, iTunes, YouTube VOD online. 'Super Troopers' Sequel is Confirmed! Get ready for "Super Troopers 2" cuz it's happening!